Men, women and youths volunteer as "study buddies" and we have a staff of two to operate our program. 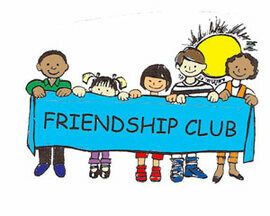 Friendship Club's operating hours from 2:30 - 5:30 pm, Tuesdays, and Thursdays, and we follow the public school calendar. Our enrichment activities include story telling, drama, games, arts and crafts, music making and singing, cooking, and taking short field trips. The children enjoy snacks and listen to Bible stories or read scripture daily. 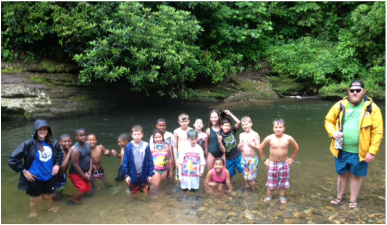 In addition, the children have the opportunity to attend summer camp each summer at Camp Tekoa outside of Hendersonville, NC. Call us if you are interested in: volunteering to be a "study buddy", sharing a special talent with the children; giving books, games, toys, or "treasures" for our token store; or donating your yard or farm for a field trip experience. We would also be happy to offer information and help to other churches interested in starting an after-school mission ministry. E-mail Becky Peeler for more information. The Friendship Club program of First United Methodist Church in Rutherfordton is seeking an assistant director for its after-school program in 2019.